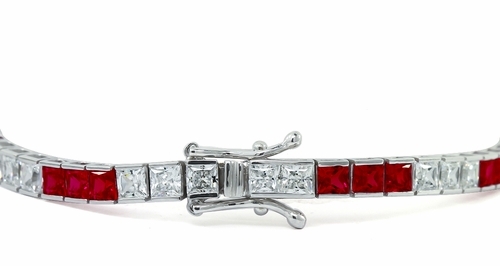 Our Channel Set Princess Cut Cubic Zirconia Tennis Bracelet with Alternating Stones is featured here with alternating colored man made gemstones and our Russian formula cubic zirconia that is hand cut and hand polished to exact diamond specifications. This bracelet is an absolute beauty and a work of art. 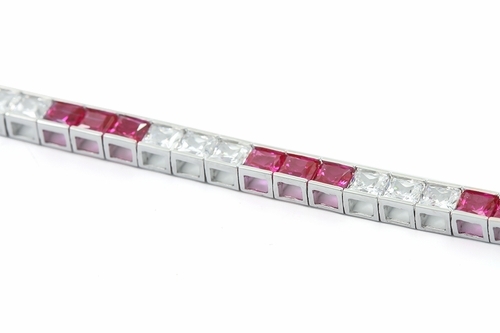 This cubic zirconia bracelet features what seems to be an endless and seamless row of alternating diamond look cubic zirconia stones and your choice of colored princess cut square man made gemstones set with such precision. 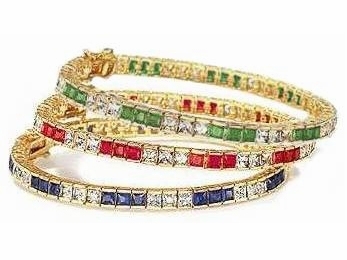 Choose from sapphire blue and diamond look, ruby red and diamond look and emerald green and diamond look in addition to 14k white gold or 14k yellow gold. A 7 inch length comes standard and an 8 inch is available, please see the pull down menu for options. 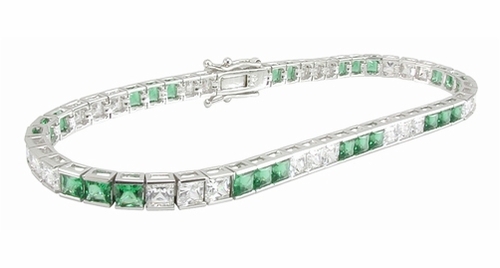 This bracelet has a total weight of 8 carats of the finest hand cut and hand polished original Russian formula cubic zirconia. For further assistance, please contact us directly at 1-866-942-6663 or visit us via live chat and speak with a knowledgeable representative. Image shows three bracelets for illustration purposes only. The item for sale is a single bracelet.